Taiwan is a medium-sized island in East Asia. It is located off the southeastern coast of China, at the western edge of the Pacific Ocean, between Japan and the Philippines. The Central Mountain divides the east and west coasts and stretches from north to south. A wonderful variety of geo-graphical contrasts exist: mountains, hills, plateaus, plains, basins, and coastline, all in which a diversity of unique flora and fauna thrive. Fig. 1 shows basic information of Taiwan, where Taipei city is the capital of Taiwan, Kaohsiung city is the biggest city in southern Taiwan, and Tainan city (conference venue) is the oldest city in Taiwan. Taiwan was first known to the West as Ilha Formosaor, Beautiful Island. Table 1 and Table 2 show the travel time by flight from some of the important Asian cities to Taipei and Kaohsiung, respectively. Table 1. Travel time from some important Asian cities to Taipei. Table 2. Travel time from some important Asian cities to Kaohsiung. Tainan, situated on the southwestern coastal plains of the island and enjoying a warm climate year-round, has been historically regarded as one of the oldest cities in Taiwan. It is now the fourth largest city, with a population in excess of 700,000. The gentle-natured people of the city are warmly hospitable, and the relatively tranquil life there seems far from the hustle and bustle of modern urban life. With its long history, Tainan is rich in historic sites and cultural heritage. Additionally, Tainan is also famous for local snack food. Fig. 3 shows the whole Tainan city’s map and Tainan’s six administrative districts near the conference venue, including Anna district, Anping district, North district, West-Central district, East district, and South district. The conference venue (Tayih Landis Hotel) is located at the Western-Central district. When visiting Tainan, visitors can see and enjoy the long historic cultural remains in the old city. After touring the scenic spots like: Taijiang National Park, Black-faced Spoonbill Reserve, Chi Mei Museum, Chihkan Tower (Chikanlou), Tainan Confucius Temple, and Koxinga Shrine (Guoxingye’s Shrine), visitors will not only get a brand new feeling, but also get their appetite satisfied. Aping district is one district of Tainan with most popular tourist sites, including Anping Fort, Anping Kaitai Matsu Temple, Yanping Old Street,Old Tait & Co.Merchant House, Old Julius Mannich Merchant House, Haishan Hostel, Anping Tree House, Lin Mo-Niang Park, and Eternal Golden Castle, and as well as famous food, including Candied Fruits, Shrimp Cake, Shrimp Roll, Oyster Omelet, Oyster Roll, Bean Curd Pudding, and so on. For more information about Aping district, please visit Anping Harbor National Historical Park website. 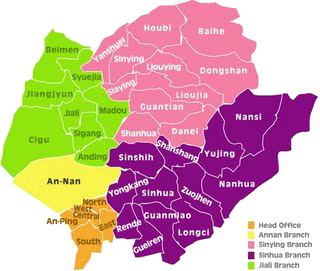 The Anping map is shown in Figs. 4 and 5. Fig. 3. Whole Tainan city map and six administrative districts near the conference venue. Fig. 4. 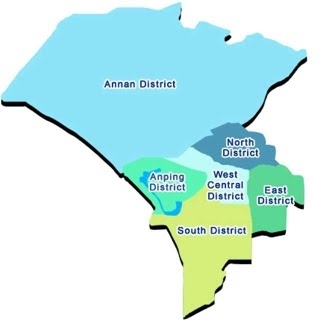 Partial of Anping district map. Fig. 5. Anpng Old Street Walking Tour. The conference venue is the 5-star Tayih Landis Hotel, situated in the historic old capital of Taiwan. This hotel is prestigiously located in the bustling new West Gate commercial area, adjacent to one of the largest department stores (Shin Kong Mitsukoshi Tainan Ximen) in Southeast Asia. It is conveniently located near Tainan’s major historic landmarks, including the Confucius Temple and theChihkan Tower (Chikanlou). Fig. 6 shows the map of the neighborhood of the Tayih Landis Hotel. This Tainan hotel offers 257 comfortable guest rooms and 49 suites. All the hotel rooms offer individual climate control, personal workstation with dataports and ADSL Internet connection, large flat screen televisions with satellite channels, three telephones, and marble bathrooms with a separate shower room. Additionally, it also takes 10-minute, 20-minute, and 30-minute drives to Tainan Railway Station, Tainan Airport, and Southern Taiwan Science Park from Tayih Landis Hotel, respectively. Fig. 7(a), 7(b), 7(c), 7(d), 7(e), and 7(f)show that pictures of the Tayih Landis Hotel of its appearance, superior single room, superior double room, Athen Room, Grand Ball Room, and Banquet Hall, respectively. Fig. 6. Map of the neighborhood of the Tayih Landis Hotel. (c) superior double room, (d) Athen Room, (e) Grand Ball Room, and (f) Banquet Hall.